We have found this time of year to be to very challenging as well as rewarding. Three major floral holidays, Easter, Professional Administrators Day (Secretaries Day), and Mother’s Day and then our local high school’s Spring Proms test our creative abilities. We accept that challenge and excel at meeting our clients expectations. Establishing a clientele that understands and trusts our artistic abilities starts with superior customer service. 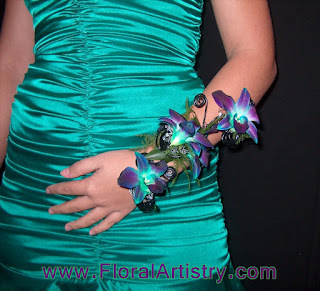 With the Color of the dress we create one of a kind Floral Accessories. We offer the matching boutonniere free with the purchase of the corsage. This makes ordering easy. Most of our couples bring in the dress or email us a picture making our job easy. All the young man has to do is remember to pick up the corsage the day of the dance. No stressing about the difference between periwinkle blue, teal and aqua. The young lady has already ordered what she wants…. Matching hair pieces are great floral accessories. Feathers are the hottest trim besides jewels. Texture, line and focal…clean and great looking! We offer several price points to fit any budget. Our Custom made arm accessories start at $59.95, deluxe corsages $39.95 and up, fancy $34.95, standard $29.95, budget package starting at $19.95. A large selection of wristlets is available to satisfy that need for eye candy. 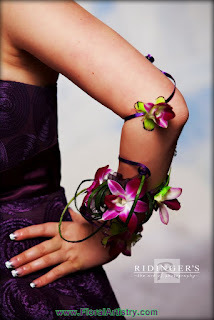 The most popular is the jeweled Fitz collection as well as the economy satin “scrunchy”. Today the choices seem endless. The choices of available botanicals have never been as diverse. 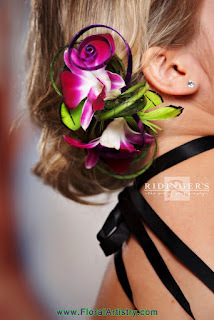 We use Gladiolas to create Glamilias. Lime green, quartz purple, and peach tones are the most popular colors. Light weight and durable Glamilias are one of my favorites. 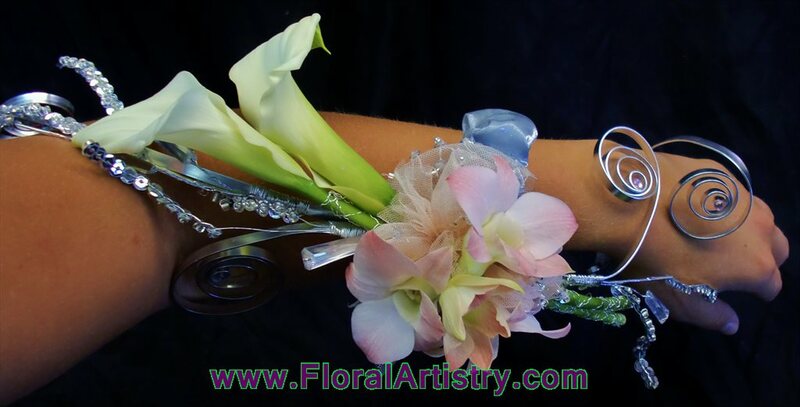 Mini Calla Lilies and Dendrobium Orchids are very popular. Both very durable and light weight this is one of our best sellers. Gerbera Daisies are available in many different colors easily matching any dress. 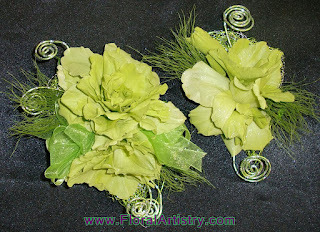 We are always evolving, inventing new looks to keep our corsages on the cutting edge of the industry. 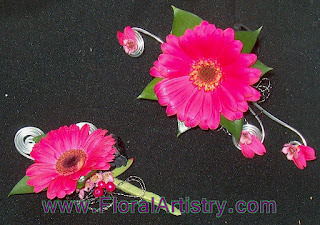 Go to our web page www.FloralArtistry.com and visit our Facebook Page for more photos and ideas. I am available for design shows and instructional workshops. 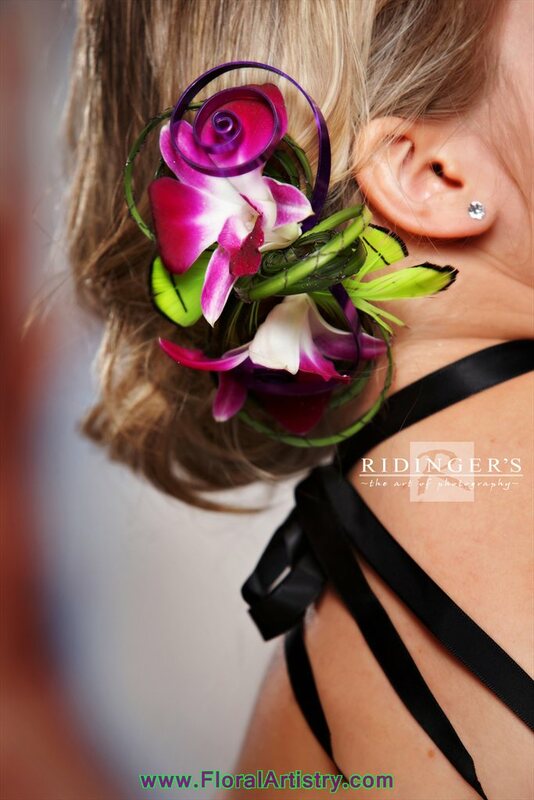 Fascinators---A New Trend for Prom!